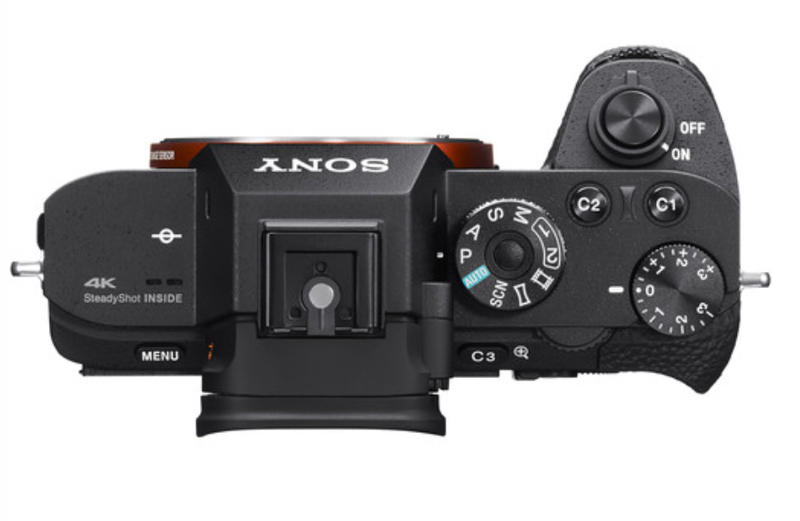 The addition of the AF/MF button on the A6300 got me thinking, how close is this camera to the A7Rii in size and layout? If you have the A7Rii and want to add the A6300 to your bag, possibly for video, AF speed or as a back-up camera, you’re probably wondering if they are similar. I scaled both cameras and overlaid them to give me an idea on the position of the dials and buttons; hopefully getting some insight into how hard or easy it will be to jump from one to the other. 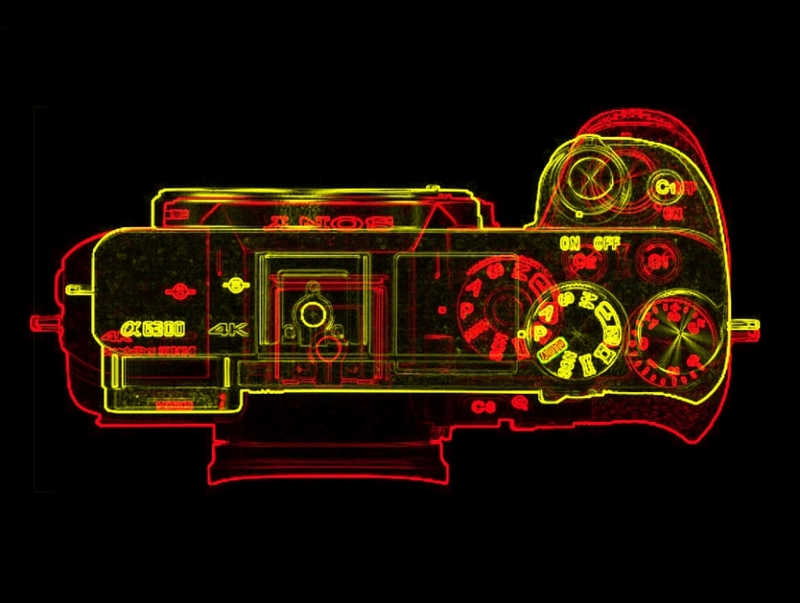 The yellow is the A6300 and the red is the A7Rii. In each view, I aligned the right edge because button placement is relative to the palm of the right hand. Between the two cameras, your right hand will most definitely feel the difference in the shape of the grip and the overall thickness of the body. The A6300 has a wider grip but the body has a narrower overall thickness by about 1/2″ (11mm). I give the advantage to the A7Rii when it comes to holding heavier lenses. The protruding grip of the A7Rii followed by a stronger recess (see below Front view) helps the middle finger support a heavier lens. A6300 120mm x 66.9mm x 48.8mm (width, height, thickness). The presence of the EVF top and center is a dominant fixture on the A7Rii; the A6300 has the EVF on the left, a plus for left-eyed shooters. 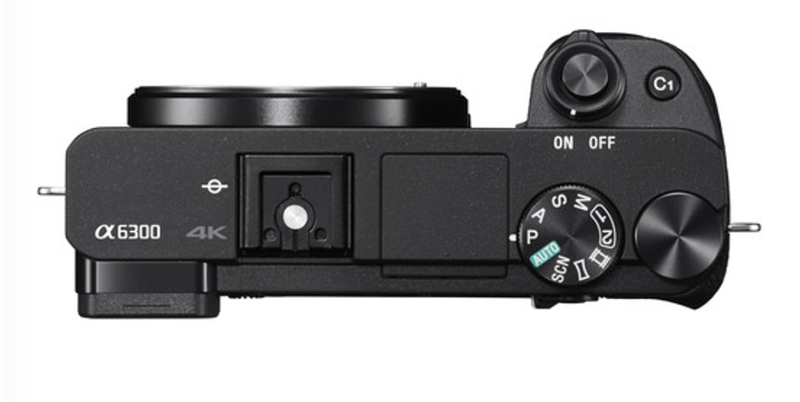 Note, the A6300 has a recessed mode dial (PASM) so the top is flat making it easier to slide into a snug spot. I’m not to fond of the placement of the MENU button on the A7Rii, it requires the left hand to press; the A6300 MENU button, on the right side, is easily pressed with the right thumb. Do you adjust your camera settings while looking through the EVF? I work by feel with the AF/MF button and to a lesser extent the compensation dial, and the aperture/shutter dials. The A6300 has fewer dials and buttons and will certainly require mental awareness when you first pick up the camera after using the A7Rii, especially in Manual (M). The lack of front dial on the A6300 and its control at the wheel will certainly create a need to fiddle with the camera. The front view shows the A7Rii to be slightly wider and taller with an EVF and mode dial that rises above the top. Check out the contour of the grip (single images below), it extends further on the A7Rii than the A6300 and gives a better lip for the index finger to support a heavier lens. Based on my experience with the A6000 and a light lens, you will find the A6300 captures the true essence of run-and-gun photography. Sometimes mobility is the key to successful images. Shooting with one hand, frees the left hand for balancing and keeps you light and nimble. The size and weight allows me to be in the mix of the action, shoot low, shoot high, run alongside, reach awkward angles and find new perspectives. Set up AF-C in zone or wide area, start clicking and let the camera’s superior focus do the work.